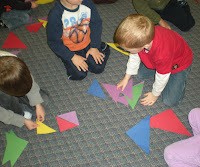 We tried to find some triangles in the room, but they definitely were not as popular in our classroom as the square. 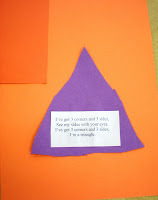 Cutting out the the triangle went pretty well. There are only about 3 or 4 children in the whole of the classes that are still having trouble with the scissors. We still help some with hand placement, but once they get going they are good. I'm so proud of them. 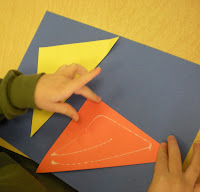 Our second page of the shape book was to make a kite using two big triangle and some smaller ones for the tail. The trickiest part of this was for them to figure out how to put the two triangles together to make it look like the kite. It's some cute sometimes to sit and watch the wheels turning. 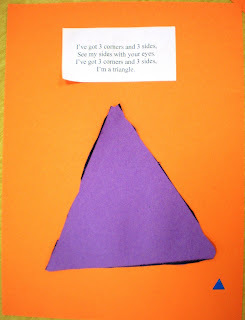 A final triangle activity I tried was to cut out lots of different sizes of triangles. Then we gathered on the floor and I spread them around the rug. 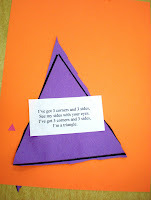 I had wanted to see if we could build different things with the triangles. The activity actually turned into a triangle hoarding session. So I had to direct it a little more than I thought I would. 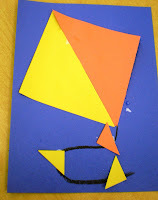 We had some boats, some butterflies, houses, and some abstract art. 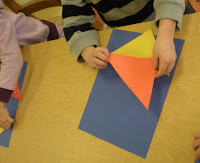 The final activity was to see if we could make a great big skyscraper with the triangles--this was suggested by me. Off to shape number three, our rectangle. I am always so happy to hear that someone was able to find ideas and projects that they can use. Awesome. I will do this for sure coz its a great idea. 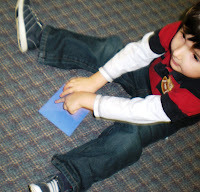 I work with toddlers/preschoolers living in a shelter with thier mothers, and we are trying to develop our child care program with more emphasis on education. I am very grateful for the ideas on your page! Thank you!